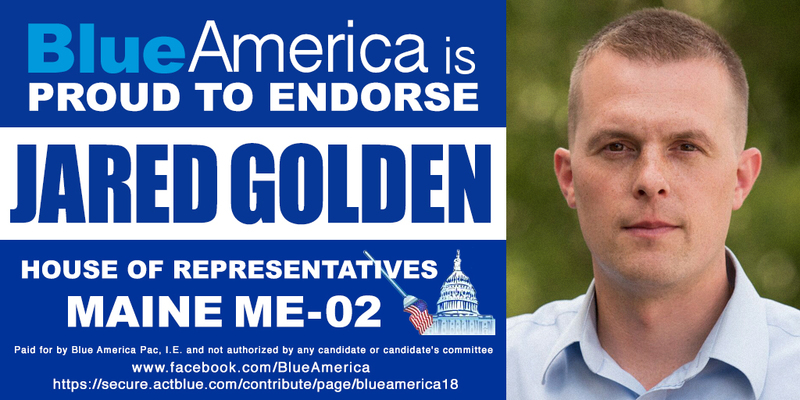 On Thursday morning at 6AM (ET) Jared Golden announced he is running for Maine's second district congressional seat, the one currently occupied by sleazy Republican Bruce Poliquin. 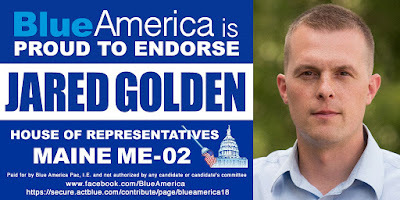 On Thursday morning at 6AM (PT) Blue America endorsed Golden. We had been working on an endorsement for him-- based on a combination of his record in the state legislature and his exemplary character and ability to accomplish his goals-- even before he had decided to run. We saw him as the perfect candidate to take the district-- which went 51.4% to 41.1% for Trump-- from red to blue... and then to do a great job in Congress. Money is always a factor-- but less so in a wave election. The first Poliquin-Cain race (2014) in ME-02 had Cain spending $1,969,517 to Polquin's $1,710,616 but he still managed to beat her 47-42%. In the 2016 rematch, she outspent him again-- $3,460,262 to $3,369,694-- but lost even worse, 55-45%, more than a 30,000 vote margin. Poliquin, a crooked member of the House Financial Services Committee, is funded by Wall Street and already has $1,163,058 in his war-chest. 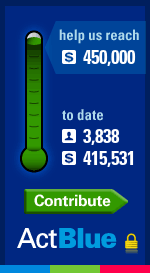 The DC pundits may not sense Poliquin is in real trouble, but he and his donors sure do. In fact, Poliquin is so scared of losing his seat-- especially with Golden now in the race-- that he told a group of supporters that he avoids speaking on the record with the press because he’s afraid he would lose his seat in the next election. "It would be stupid," he said, "for me to engage the national media and give them and everybody else the ammunition they need... As soon as you go down that path, you are in the swamp." Poliquin's been in the swamp for his whole career and it isn't just the media he avoids. He refuses to hold town hall meetings with his constituents and operates under cover of darkness in all he does. He does however meet with wealthy donors, lobbyists and far right extremist groups. This week he was meeting with wing-nuts from the Maine Heritage Policy Center and, aside from admitting he hides from the media, attacked Susan Collins in a way he would be afraid to ever do in public. Much of what he said is just plain false-- like an assertion that TrumpCare cuts Medicaid. He calls it "a flat-out untruthful statement" but the Congressional Budget Office reported that the bill Poliquin voted for-- and is now trying to pretend that he didn't to low-info voters who don't pay close attention-- would reduce Medicaid spending by $834 million over the next decade and leave 23 million more people without health insurance. That's why Poliquin's habitual ducking of public town halls and refusals to sit for interviews with the media are making more and more Mainers realize he's unfit to represent them. He told Maine Heritage Policy Center supporters-- which was detailed in a secret recording of the talk provided to the Maine People’s Alliance-- that with the House passage, it became the Senate’s turn to act. But it refused to support any alternative offered, stalled in the end by the opposition of three senators, including Maine’s Susan Collins, a Republican. “How can anybody vote not even to start debate on an issue this important?” Poliquin asked. “We have done what we needed to do in the House. Pray for our senators. Reach out to whoever you think you should,” Poliquin said. Poliquin appeared to take aim at Collins in particular. “Now, for some people to say ‘Well the reason I can’t support this, Bruce, is because it cuts Medicaid,’ that is a flat-out untruthful statement,” the congressman alleged. Collins denounced the House bill last month. She didn’t call it a cut, but she made it clear that she didn’t agree with efforts to reduce its growth so sharply. Experts said that the bill backed by Poliquin would have caused Medicaid enrollment to go down by 16 percent among those under the age of 65, people the CBO report made clear would likely wind up without any insurance. Please consider contributing to Jared Golden's campaign by tapping on the Blue America 2016 ActBlue congressional candidates page on the right. Let's help him catch up with Poliquin's hefty Wall Street stash of cash. By the way, for those keeping track, while Poliquin has been serving on the House Financial Services Committee, he has been soliciting legalistic bribes ("donations") from the banksters and he has already taken $1,557,174 from the very people over whom he's supposed to be exercising some degree of reasonable oversight. His voting record on the committee wouldn't be any more detrimental to consumers and working families if he just allowed the Wall Street bank presidents to take turns voting in his place.